Twelve times Hungarian champion, reigning Continental champion and a three times world finalist who started out at his home town club Volans and has developed into a top star on the European circuits. Joined Sheffield mid-way through the 1995 season making his British league debut, his only previous British appearances being 2 Bradford staged World finals plus World Team Cup and Pairs events A hardy, full-throttle merchant with a shrewd tactical brain, Zoltan first won his country's individual title in 1983, and apart from 2 seasons, has dominated the event ever since. His honours also include winning the FIM 'Champion of Champions' Cup, a competition embracing the champions from 16 different speedway nations. Top Grass-track exponent who was British 350cc champion before having initial shale outings at Stoke in 1986. 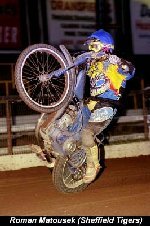 Returned to the speedway circuits in 1993 at Wolverhampton where he held down a reserve berth for much of the season, and played a similar role when moving to Bradford last term. 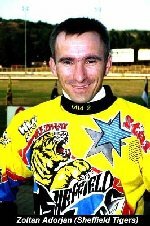 Made his Owlerton debut on August 18, 1994 when finishing runner-up (12 points) to Peter Scully in the Young Guns Individual meeting. Joined Sheffield on the eve of the season. Off-track he runs an office cleaning business in his home town. The 1993 World Champion and one of the greatest riders of his era. His initial interest in speedway was sparked by his sister-in-law who tempted the then moto-cross star to his local track at Costa Mesa in the early eighties. Rode regularly both there and at San Bernadino before making his British debut at Poole in 1983. He returned to join Wolverhampton in 1986, just 12 months after finishing third in the World final at Bradford. Spent 10 years with the Wolves scoring an incredible 4,041 points from 309 league matches before joining Sheffield this season. Other major honours: World Pairs Champion 1992; World Team Cup Champion 1990, 1992, 1993, 1994; USA Champion 1993; Division One Riders Champion 1994. Born of Polish parents, Robert now lives in Koblenz and it was his sparkling displays with Diedenbergen in the German Bundesliga which alerted Sheffield to his potential. An accomplished long-track performer, Robert wants to follow in the tyre treads of England's Simon Wigg who has had a highly successful career in both disciplines. Joined Sheffield in July 1994 and reached the World U-21 final at Elgane, Norway in August. Missed last season due to serving 12 months compulsory service in the German Army. Protégé of ex-Czech international Zdenek Majstr, his early league outings were for club side Red Star, Prague. One of the most exciting and spectacular riders in world speedway he has endeared himself to the Owlerton faithfull with his fence scraping 'Wall of Death' style. A five times world finalist and reputed to be one of the strongest riders in the sport, Roman made his British bow at Ipswich in 1986, followed by a three year spell at Coventry. Has been with the Tigers since 1993. Born Huddersfield, West Yorkshire, 26th July 1975. A former junior grass-track champion who started speedway at Odsal training school when 16. Made his league debut in 1991, but retired 3 years later to purchase his own local concrete works business with his mother June as a partner. Recalled by the Dukes last year after injury to Simon Green and won his second KO Cup winners medal to add to the 1993 success. Also rode at British League Academy level with Berwick last year, but found himself ousted during the winter after Bradford re-shaped their team. Born Kolding, Denmark, 13th December 1974. Hails from the birthplace of Jan Staechmann and Frede Schott and started out in the Danish junior scene in his mid-teens. Rode for Holsted in the Superliga in 1995 but switched to Herning this year where he rides alongside Hans Nielsen. His family own Dan-Kemi, the country's biggest chemical business, who sponsor the Danish national side and whose logo is emblazoned across their race-jackets. Speaks fluent English and has a stable of lay-down engines. Born West Meltham, Yorkshire, 5th January 1972. He has been riding bikes since the age of six, eventually graduating onto the junior grass-track scene. 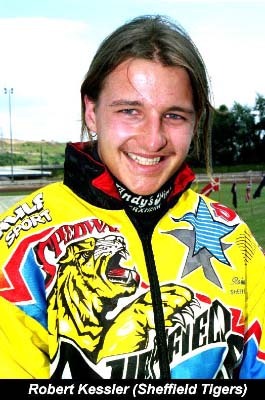 Gained shale experience at Cradley and Stoke before his league debut for the latter in the National league in 1990. Has had several injury setbacks over the years until joining British League Division 1 side Bradford in 1994. Reached the Overseas final of the world championship at Coventry last year but failed to score. Released by Bradford in February after they had signed British champion Andy Smith from Coventry, Garry joins the Tigers on loan. Made his league debut with Division 2 Norden in the Bundesliga in 1991, but is currently riding with MC Gustrow in the Superliga where last year he notched a 6.25 average. 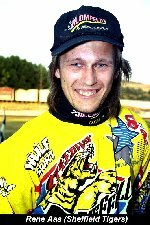 Current German Junior champion who in 1994 became the youngest ever winner of the prestigeous Red Tape Individual meeting at Pardubice, Czech Republic. Has ridden in the last two World U21 finals at Elgane, Norway in 1994 (2pts) and Tampere, Finland 1995 (2pts).